Shipping weight = 1.18 lbs. Leather Therapy® Wash easily deep-cleans even the toughest dirt and grime problems without hardening or darkening leather. Concentrated micro-suds lift out embedded dirt, leaving leather clean with a wonderfully soft feel. This wash does easily remove mold and mildew off the leather. It is easy to use, pleasant smell, does not darken the leather, just as it says! I would recommend this product. Great leather cleaner that everyone should try, cause you'll fall in love. Works well on leather that needs a real deep cleaning, through sweat, mud and everything in between, this does the job. Does not make the leather darker either! When it's still soaking in, it can look darker, but mine usually dries to it's normal finish within 24 hours. Great product for cleaning anything leather. I tried this product a year ago on a saddle that had lots of tooling and tons of dirt. It works great. Follow the directions and you can't go wrong. It is easy to use. Removes mold and mildew and helps keep it from coming back. Best product I have used so far. I highly recommend it. Excellent product- completely removed green mold off my saddle and didn't darken the light oil finish. Highly recommend. This cleans so well and I love that rinsing is not needed! It really does help stop mold growth, which has been a problem in our high humidity climate. I bought the 12 pack of tack sponges, spray directly on the sponge and wash. Also use and love the Leather Therapy Conditioner. Will definitely buy again, thinking about buying as Christmas gifts for my riding buddies! I like that it is sprayable. You don't have to open & close the bottle and worry about spilling it and it cleans very well. 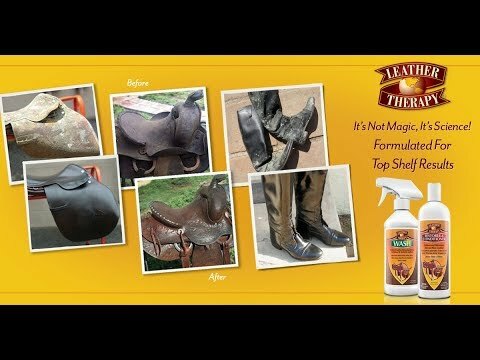 I have used Leather Therapy Wash for several years and it works very well. Just sponge it on and it cleans the leather and keeps it soft and supple. Easy to use and a little goes a long way. Makes a great gift too. This is the only product I use to clean tack! Looking for a better way to care for our leather saddles and other tack. I like the wash for cleaning my saddles. It is a little pricey but it works well.